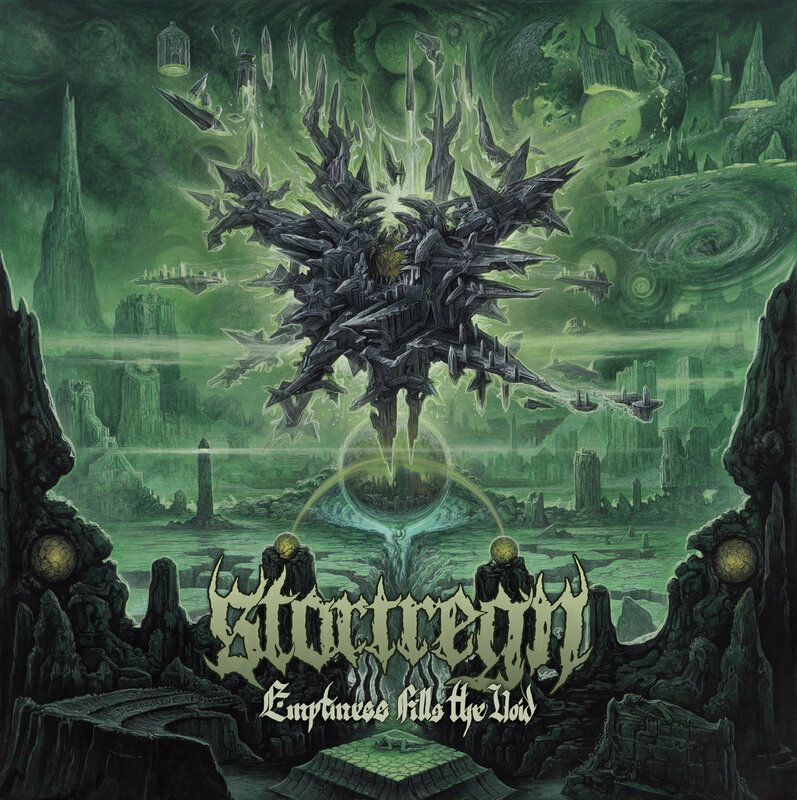 The Background: Stortregn, hailing from Geneva, Switzerland, have been kicking around in the underground for just over a decade, and Emptiness Fills the Void is their fourth full-length. Previous outings failed to make a strong impression on me, as their brand of Dissection-influenced black/death metal has been done to death, and no pretender has ever topped the original. Perhaps conceding this point, Stortregn have emerged from the shadow of their primary musical influence with a massive dose of fretboard fireworks and blistering drumming. They may have been black metal once, but they’re tech death now, and proud of it. Luckily, all that prior songwriting experience was not left behind, which brings us to this album’s main draw: while this sort of flashy, tremolo-obsessed tech death has become considerably more common of late, this band is one of the few in the field with the wherewithal to write good songs. The Pros: There’s a focus on melody here that can be hard to find in extreme metal, and the band has the important ability to recognize when their own riffs are good; one thing I noticed consistently throughout the record is the re-emergence of only the choicest melodies, often backed with catchy vocal patterns. This trick is immediately apparent from opener “Through the Dark Gates”, which hammers its primary riff with such dedication that it runs through my head for hours after listening. Every track on this album has a selection of such moments, which is what brings me back to them repeatedly. With a roster that boasts a dizzying and somewhat confusing abundance of guitarists and bassists, the subtlety of the two- and three-guitar harmonies and the agile, confidently melodic bass work take center stage. The guitar solos and leads are suitably face-melting, and there’s finger-shattering riffs here (“Nonexistence”) that lesser bands could never keep up with. An even-handed, if treble-y, mix helps to ensure that no band member is completely buried, though the guitars are clearly the emphasis. The Cons: It’s hard to take much away from this album if you’re a fan of this particular style. They do rely far too heavily on spoken-word passages. This tends to detract from the music and is also a distraction that tends to crop up during the album’s brief quiet patches, making them less enjoyable. An additional issue is that the proceedings are relentlessly one-note. Tempos are almost universally very fast, and “slow” for this band is still a pretty brisk mid-tempo. Though the riffing is pleasantly unrestrained, the bulk of the album is absolutely overflowing with tremolo picking, and even the more death metal-inflected riffs usually have an undercurrent of swarming notes. This sort of constant activity will be a turnoff to some. With the exception of well-placed instrumental interlude “The Chasm of Eternity”, which eases the pedal off the metal to provide a needed breather, the album just does not let up one bit. And at a beefy 51 minutes, there’s not a lot of replay-ability. You’re spent after one trip through these dark gates.